Jainism is an ancient dharmic religion from India that prescribes a path of non-violence for all forms of living beings in this world. 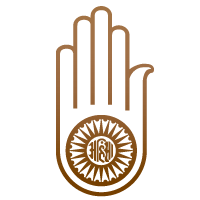 The religious Ahisma hand symbol with a wheel on the palm symbolizes the Jain Vow of Ahimsa, meaning non-violence. The word in the middle is "Ahimsa." The wheel represents the dharmacakra, to halt the cycle of reincarnation through the pursuit of truth.